This is a series of experiments. The goal? To create as many successful, tasty, frozen treats as possible by manipulating the sciences that form them. This is a Flickr badge showing public photos and videos from icecreamalchemy. Make your own badge here. Thank you for your donations! These are what make it possible for me to keep my ice cream samples free, and for me to continue to receive feedback and data on the quality of my products. If you have sampled one of my ice creams, please submit a review at the following website. It is a very simple guestbook layout, but if you could please answer the questions provided in the first entry I would greatly appreciate it. Thank you! The past few days my mind has been a-flurry with ice cream inspiration. 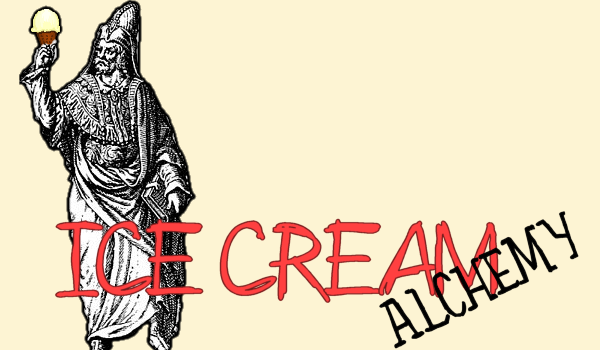 Flavor concepts, plating ideas, scoop & sweet pairings, I even drew out a potential logo for my future ice cream shop! All in all it has been the brain-waves that I have been dying for lately. I was in a super rut, and now it feels like I'm in four-wheel drive and gettin' outta the mess! I began my come-back with two experiments. The first was an all-vegan version of my Matcha Mint Chocolate Chip Ice Cream (Please remember to rate my recipe!) which actually did not turn out well at all. The mint overpowered everything and for some reason it came out very gritty. My second experiment was a new concept for me: Vegan Carrot Cake Ice Cream. I had it all worked out in my head...The base would be freshly grated carrots soaked in soy milk, mixed with date paste, agave, cinnamon, and fresh ginger. 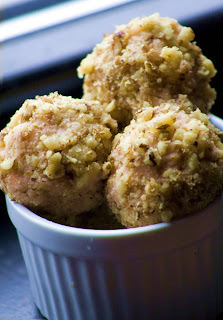 The final product would be round balls of ice cream coated in crushed walnuts...YUM! The flavor turned out spot on...the texture, however, could use some work. I found out the hard way that soy milk is pretty much water. It makes the ice cream incredibly icy and impossible to scoop even WITH stabilizers and alcohol! What stabilizer did I turn to, you ask? Well...I made my own! I was disappointed in all of the options presented to me, so I decided to use my BFF science to my own advantage. Of course there is no way for me to tell if it worked yet because the soy milk pretty much nullified any chance, but here was my theory. 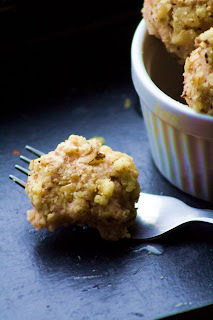 In a blender, combine silken tofu, dates, and soy creamer. Over very low heat, mix together date mixture and agave until combined. Add spices and 3/4 of the shredded carrots. Allow to sit overnight. Strain carrots out of mixture, add rum, and churn until thick. During the last 5 minutes, add the remaining shredded carrot. Store in a freezer proof container. 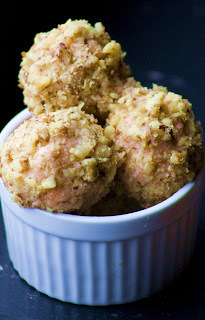 When serving, scoop ice cream into balls and toss in chopped walnuts. Top with some dairy free whipped cream or vegan cream cheese frosting for extra authenticity! Perhaps you can add a swirl of cream cheese to make the "Ice Cream" not so icy? this sounds super interesting. one of my good friends is a vegan and this sounds like something she has never tried! i want to experiment more with silken tofu in ice cream... great recipe, i will try it and let you know how it goes!! also, AMAZING that you made your own stabilizer! !